Chipotle is planning to launch a loyalty program on Friday, its latest effort to win back customers scared off by food-safety issues that have troubled the chain since late last year. 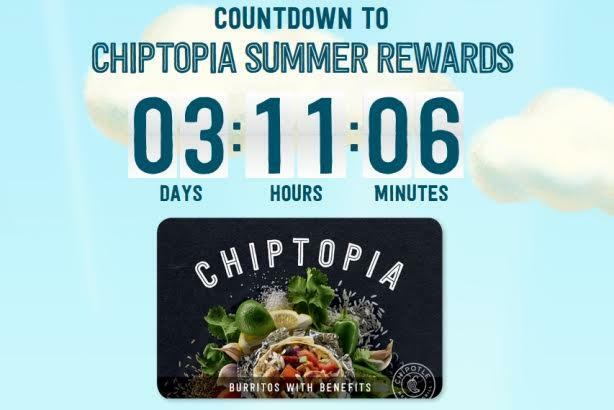 The company unveiled a multimedia-filled webpage counting down to the July 1 launch of the program, called Chiptopia Summer Rewards, on Monday morning. The top of the page features a large countdown clock, as well as a video and infographic explaining how the rewards program works. It also prompts visitors to supply their mobile phone numbers and agree to receive alerts and offers from the company via text message. "Chiptopia is not a typical rewards program," the site explains. "Rewards are not based on the total amount a customer spends, or on accumulating points. Instead, Chiptopia rewards customers for making multiple paid visits to Chipotle within a given month." The program enables customers to get free entrees, Chipotle merchandise, and includes bonus rewards such as catering for 20 people, which is worth $240. Chipotle also distributed a press release about the loyalty program on Business Wire on Monday morning. As of early afternoon on Monday, the company had not posted about the initiative on its Twitter or Facebook accounts. However, its social media team was directly responding to inquiries about the rewards program. Chipotle is launching the rewards program as it tries to rebound from the food-safety challenges that have plagued it over the past year. Harris Poll results from earlier this month found that Chipotle had been surpassed by Moe’s Southwest Grill as the most popular Mexican restaurant chain in the U.S., and a November 2015 survey by YouGov found that consumer perception of Chipotle was at its lowest level since 2007. Chipotle reported its first quarterly loss in Q1 2016 since it went public, with same-store sales down 30% from the prior year and a net loss of $26.4 million. The burrito chain hired Burson-Marsteller as its US AOR in March. However, Chipotle communications director Chris Arnold said via email that the rewards program was developed in-house. "There is a media relations component, but most of the promotion will be in-restaurant, social, and some online advertising," Arnold explained. "The concept was developed internally at Chipotle, but Burson is part of the broader team supporting it." He noted that Chipotle could make the rewards program permanent depending on its performance. "We are considering a longer-term program and will be looking at the Chiptopia Summer Rewards program to see how customers respond to it, and how we might work that into a more lasting program," Arnold said. The Denver-based company has tried out a flurry of coupons and buy-one-get-one offers in recent months. In February, Chipotle closed its doors nationwide for one day to discuss with employees how the chain was handling the E. coli outbreak linked to its locations, offering coupons to customers who had their lunch plans disrupted. The following month, it partnered with Avocados from Mexico on the Guac Hunter digital photo-hunt game, which gave users the opportunity to win free orders of chips and guacamole. Chipotle split with previous AOR Edelman last fall due to a client conflict. In 2014, Edelman, along with Creative Artists Agency Los Angeles, won the Grand Prix and a Gold Lion at the Cannes Lions International Festival of Creativity for its work on The Scarecrow campaign for Chipotle.